Theodore Roszak, Woman (artist’s grandmother) in Veiled Hat with Cactus Plant (1927), lithograph in black on cream wove paper, image 16 1/2 x 12 1/2 inches. Courtesy the Estate of Theodore Roszak/Licensed by VAGA, New York. Theodore Roszak, Botanist II (1928), lithograph in black on cream wove paper, image 16 1/2 x 12 1/2 inches. Courtesy the Estate of Theodore Roszak/Licensed by VAGA, New York. 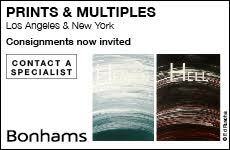 His understanding that Bellows had seen “pertinent European influences as valid in the American developmental process”6 probably contributed to his decision to go to New York in 1926, seeking exposure to more advanced ideas than those offered at SAIC. He studied printmaking with the American Impressionist Charles Hawthorne at the National Academy of Design7 and enrolled in philosophy courses at Columbia. Roszak soon left Hawthorne, however, to take private lessons with George Luks. Roszak returned to Chicago to continue his studies at the Art Institute, where he could take advantage of their facilities and financial support that covered his expenses.8 In 1927 he received a fellowship to return to the East Coast and study “lithography and all its technical implications in Woodstock, New York,” where Bellows had lived for six months a year from 1920 until his death.9 There Roszak met Bellows’ friends, including Yasuo Kuniyoshi, Eugene Speicher and Leon Kroll, a group, which he described as “a kind of American School,” that “were really making a contribution.”10 The following year Roszak was appointed full-time instructor in lithography and drawing at SAIC, and the prints he had made in Woodstock were shown at Chicago’s Allerton Galleries. 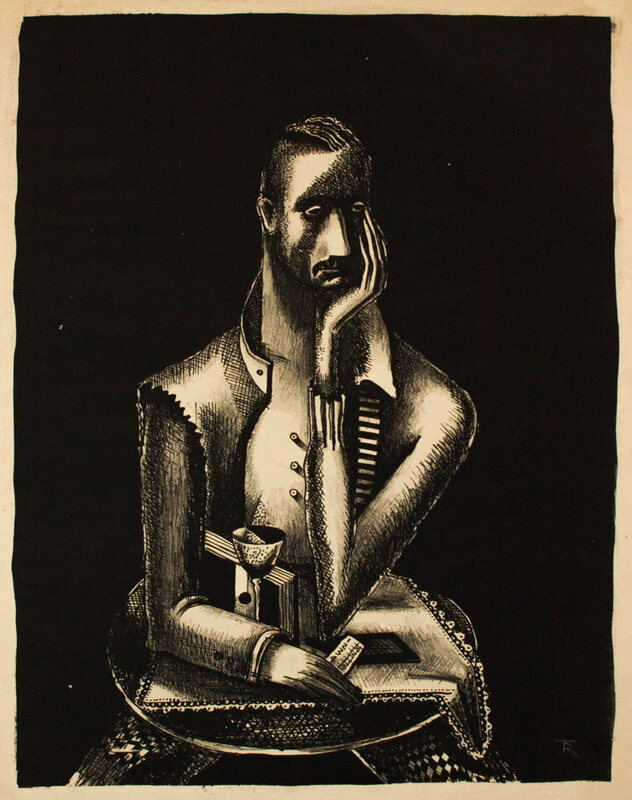 Theodore Roszak, Portrait of a Painter (1928), lithograph in black on cream wove paper, image 16 7/10 x 12 1/2 inches. Courtesy the Estate of Theodore Roszak/Licensed by VAGA, New York. 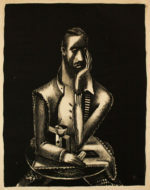 Prior to 1931, Roszak’s lithographs were portraits and figure studies made on zinc plates and printed in black ink on white or off-white paper.11 Although some impressions are inscribed with edition numbers, he did not print complete editions, perhaps because at this time he considered printmaking primarily as a vehicle for experimentation.12 Portrait of a Man (1927), for example, is inscribed “Tone Experiment” in the plate. The subject matter of these prints was drawn from the artist’s domestic life. He pictures his father (OJCIEC ), his grandmother and himself in rooms fitted with furniture and potted plants. Aspects of his mature style are already evident in both Woman (artist’s grandmother) in Veiled Hat with Cactus Plant (1927) and Vanity (1928). The carefully structured composition of curves and diagonal lines may be adaptations of Bellows’ ideas about “dynamic symmetry,” which Roszak considered “a system of picture building.”13 Balancing his concern with fundamental geometries, Roszak scattered decorative detail across the surfaces of these prints, an indication of his life-long attentiveness to texture and pattern. Roszak paid particular attention to the attire of his sitters, perhaps influenced by his mother’s former profession as a dress and hat designer in Poland;14 he also sometimes depicted the embroidered linens she made in America.15 Untitled (The Chess Player) and Botanist II (both 1928) appear to be self-portraits of the young artist engaged in his own hobbies. Here again Roszak pushed the images toward decorative abstraction with a busy array of extraneous patterns and small objects contained within the framework of the windows and walls. Contrasting pattern also informs his image of a brutish, card-playing jailor (or prisoner—the title is ambiguous) made the same year, from the wide stripes of the figure’s shirt and the designs on the cards he holds, to the checkerboard floor and repetitive steps of the stairway that curves into nowhere. The surreal disquiet of this image is predictive of the darker emotional world of Roszak’s later sculpture, drawings and prints. Theodore Roszak, Staten Island (1934), lithograph in black on orange wove paper, image 13 x 20 inches. Courtesy the Estate of Theodore Roszak/Licensed by VAGA, New York. 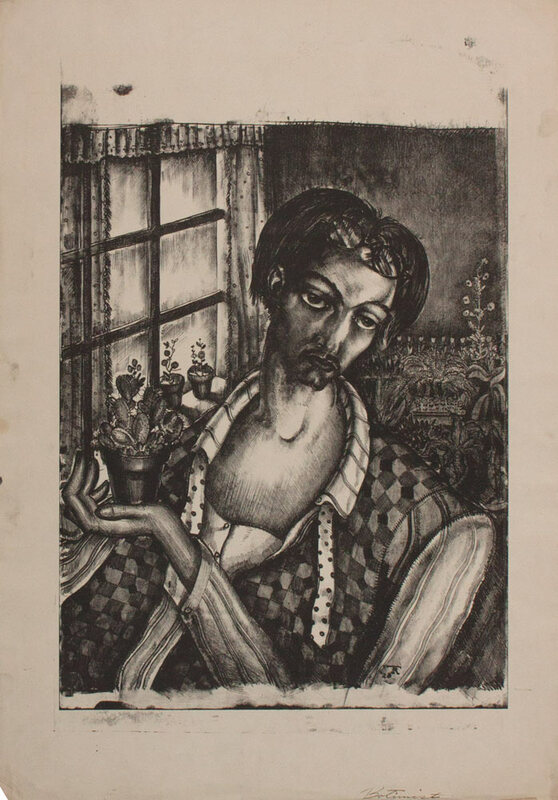 Portrait of a Painter (1928) retains this interest in patterns and textures, but places greater emphasis on the geometrically constructed abstract composition. The entire surface spins; the tilted skylight, the flowered curtain, the circle of the palette, the spikes of the brush handles, the checkered floor and even the reflections in the eyeglasses (a trope he returns to in one of his late lithographs)16 whirl about with dizzying effect. The traditional Polish costume worn by the Girl in Lace Bonnet (1929), which he must have seen in his Polish neighborhood,17 also emphasizes the geometry of the composition. The circle formed by the curved edges of her hat and her large round white collar is intersected by a triangle formed by a tall potted plant and the neck of a violin (an instrument Roszak loved to play). The Polish folk costume, the violin and the potted plant all seem to represent Roszak’s life as a young man in Chicago. 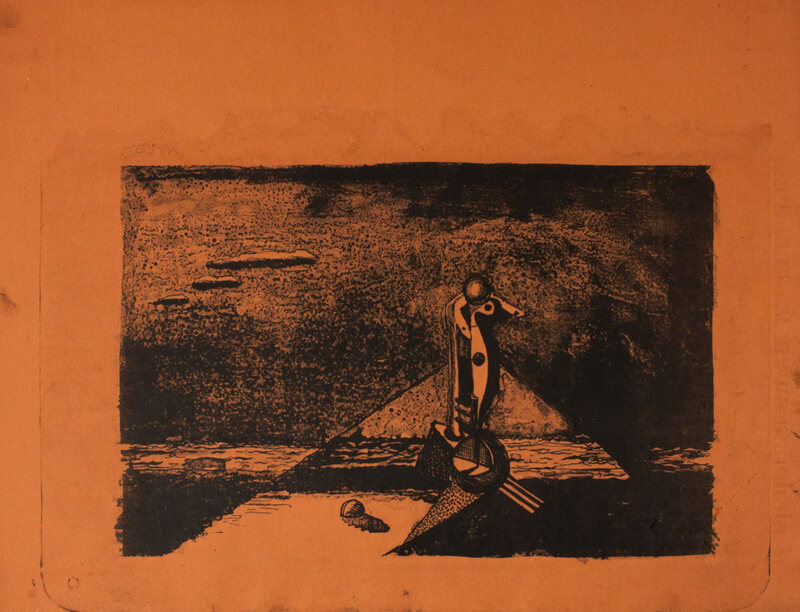 Theodore Roszak, Study for Composition Alastor (1931), lithograph in black on orange wove paper, image 6 1/4 x 9 1/2 inches. Courtesy the Estate of Theodore Roszak/Licensed by VAGA, New York. He did not move back to Chicago. With his new bride, Florence Sapir, he moved to Staten Island and began creating painted plaster constructions. 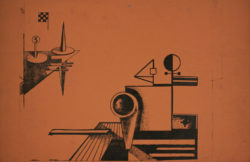 Though he had made no prints during his European sojourn, Roszak now acquired a lithography press and began making prints that were clearly informed by European modernism.25 Staten Island (1934) offers a Constructivist-inspired arrangement of flat shapes and geometric objects, but it remains rooted in the artist’s immediate surroundings, in this case the Staten Island waterfront: one can recognize abstracted wooden piers, a ferry’s smoke stack and nautical flags. In Chicago Roszak had used different monochromatic inking schemes; now he began to experiment with colored papers and color printing. In Staten Island, Roszak augmented the drawn composition on the plate with inked color in bright blues, yellows, reds and browns that closely relates to a painting of 1933. 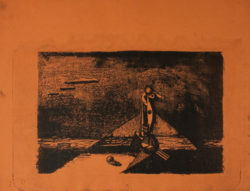 Roszak also printed this plate in somber tones on orange paper and in black on orange paper. Theodore Roszak, Woman Seated at a Table with a Sculpture (1931), lithograph in black on orange wove paper, image 4 1/2 x 7 1/2 inches. Courtesy the Estate of Theodore Roszak/Licensed by VAGA, New York. At this point in his career, Roszak’s paintings, prints and sculptural work were all closely connected. His 1931 painting, Composition Alastor,26 shows the abstracted body of a man playing a violin entwined with that of a woman—a celebration of Roszak’s love of both music and his new wife.27 He subsequently made many studies on paper of a sculptural idea utilizing the same image, one of which he used in his lithographs Study for Composition Alastor and Woman Seated at a Table with a Sculpture (both 1931), printed in black on orange paper.28 In the former, the sculpture appears in the center of a mysterious landscape reminiscent of de Chirico. In the latter, the woman is posed to match the machine-like forms of the sculpture; one arm is bent with the hand under her chin, the other rests on her lap to form a rectangle. 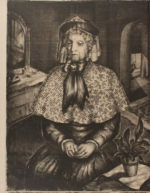 Roszak had taken a photograph of his sister, Aniel, with a very similar composition; even the arrangement of light and shadow and the shape of the table are the same (though reversed in the print). He later used the same pose again, in a 1934 charcoal preparatory study for the painting Girl at the Piano Recording Sound (1935). 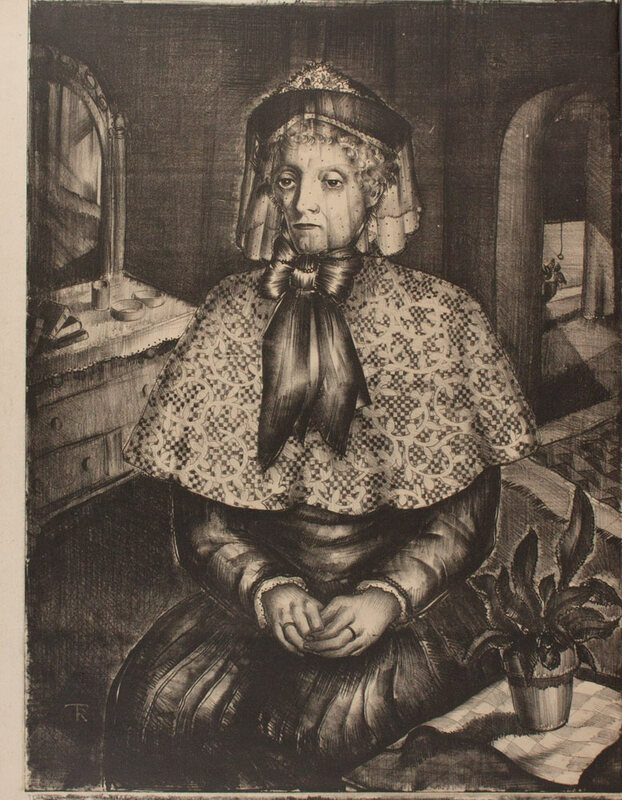 The lithograph Girl in Bonnet (1933) is a portrait of his wife, Florence, in a triangular cape and a large, cubistic, veiled hat (this is also closely related to a photograph taken that year). The lithograph was printed in red and then hand-colored with red ink applied by brush in a loose, airy manner, giving the image the appearance of a watercolor. He later painted two bust-length portraits of Florence in the same hat. 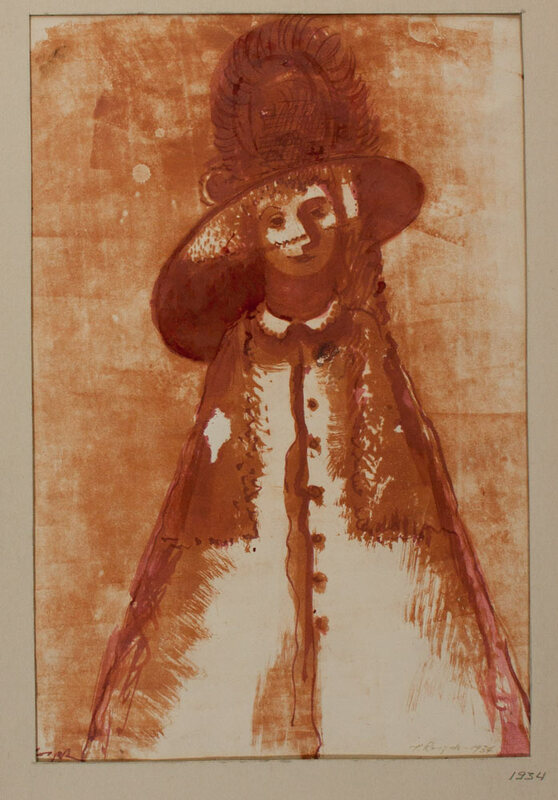 Theodore Roszak, Girl in Bonnet (1933, this impression misdated by the artist as 1934), lithograph in red ink, hand colored with red ink on cream wove paper, image 12 3/4 x 9 1/2 inches. Courtesy the Estate of Theodore Roszak/Licensed by VAGA, New York. Another group of works—two prints and a painting—feature a bust-length picture of the artist holding a violin and resting his left elbow on a table in the foreground. 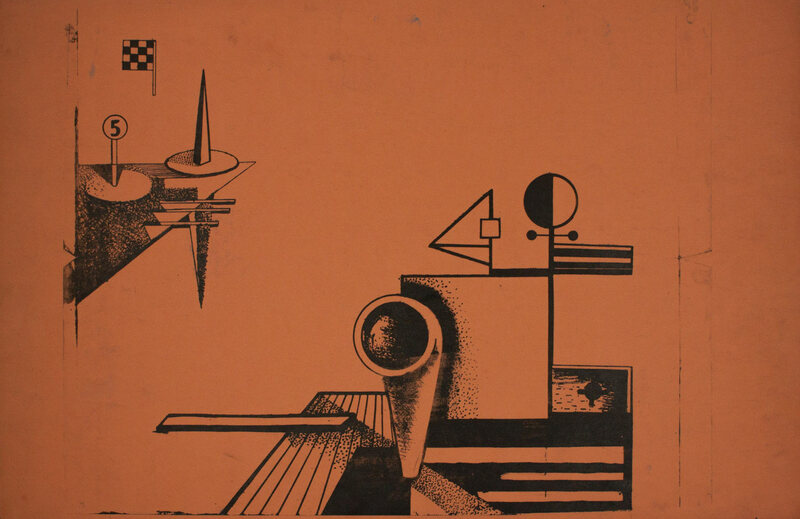 The first of the prints (1930) is stylistically related to his work of the late 1920s, whereas in the second (1933) and in the painting, he simplifies the forms in accord with Constructivist/Cubist concepts. 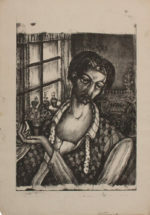 Roszak made proofs from this 1933 plate in black ink on white and on colored papers, and one printed in colors that closely relate to those of the painting. By the time of Roszak’s 1934 Man Seated at a Table, no. 2 (Self Portrait), his mechanization of human forms has become more exaggerated. Here the artist rests his head on his hand like the Woman Seated at a Table with a Sculpture. As in his earlier prints, he has elaborated decorative elements—a tablecloth with a tatted border on the table, checkered pants, and jacket ornamentation—but in simplified and abstracted form. 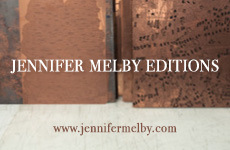 This plate was also printed in black on orange paper and on cream paper, and with inked color. Theodore Roszak, Man Seated at a Table, no. 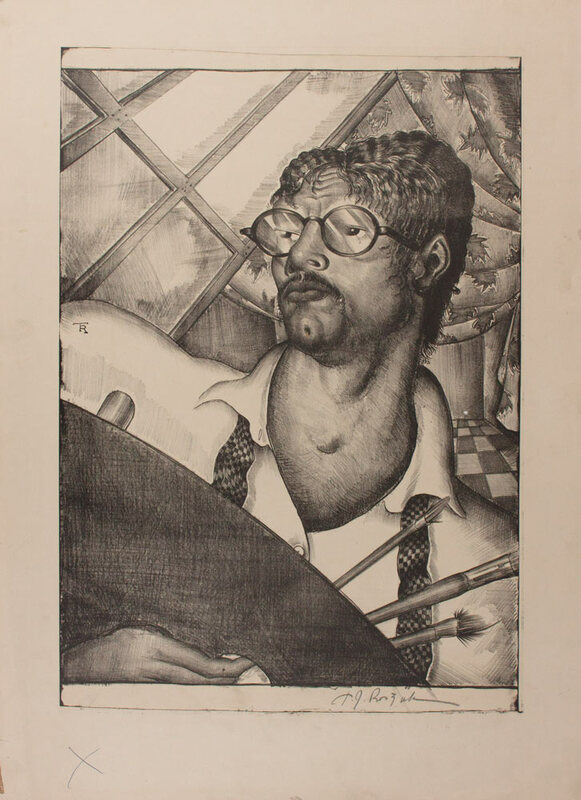 2 (Self Portrait) (1934), lithograph in black on cream wove paper, image 19 x 14.85 inches. Courtesy the Estate of Theodore Roszak/Licensed by VAGA, New York. These works mark the end of Roszak’s first printmaking period. In 1935 he and his wife moved to Manhattan, and a large retrospective exhibition of Roszak’s paintings, drawings, lithographs and watercolors was presented by the International Art Center of Roerich Museum in New York.29 For the next few years, when Roszak was employed on government projects sponsored by the Works Progress Administration, he focused his personal work on Bauhaus-style reliefs and constructions. During World War II he learned to weld airplane parts while working at Brewster Aeronautical Corporation in Newark and also taught navigational and engineering drafting at the Stevens Institute in Hoboken. 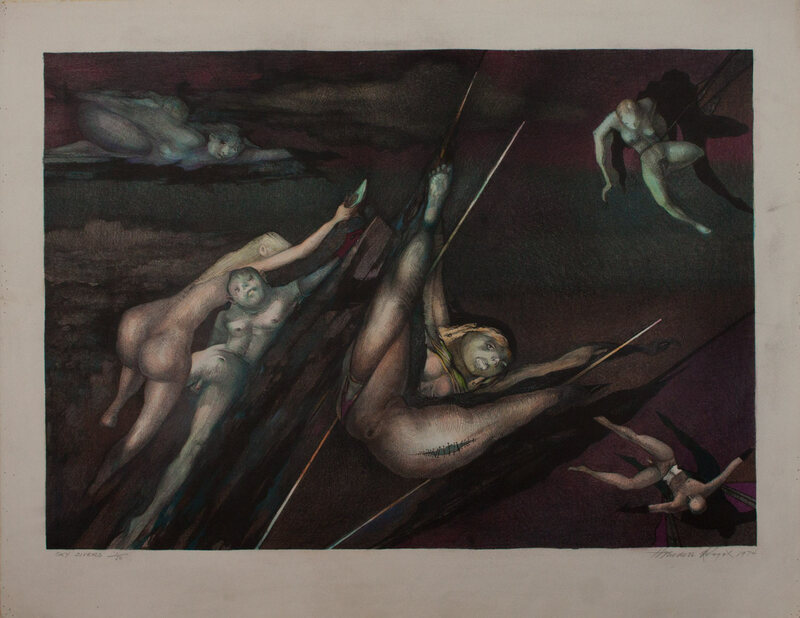 Theodore Roszak, Sky Divers (1974), lithograph in black, hand-colored with colored pencil, image 19 x 26 3/4 inches. Courtesy the Estate of Theodore Roszak/Licensed by VAGA, New York. 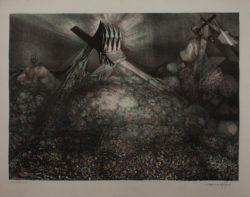 When a second heart attack in 1969 left him physically unable to weld, he began to focus on large, detailed drawings that he constructed from patterns of fine lines in graphite and blue or black ballpoint pen, with ink washes.32 The apocalyptic visions conveyed by these drawings relate to the existential themes of his steel sculpture, and are the source for the style—and on occasion the imagery—of Roszak’s second body of lithographic work, executed between 1972 and 1974. Though he had not made prints for 38 years, Roszak had not lost the affinity for lithography that he had acquired as a student. The technical virtuosity and wildly imaginative content of these new prints are rooted in the skills and the imagery of his lithographs of the 1920s and ’30s. Once again Roszak worked on zinc plates, but this time with the assistance of master printer Burr Miller (whose father, George Miller, had worked with Bellows and whom Roszak had known). 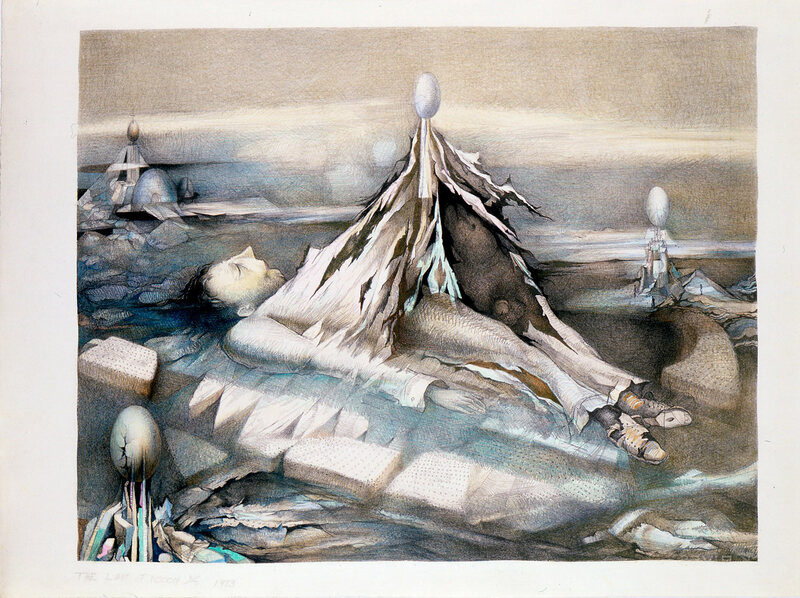 Roszak initially intended to release these prints in editions of 50 (as some are marked), though ultimately only a small number of impressions (between seven and fourteen) of each were pulled. 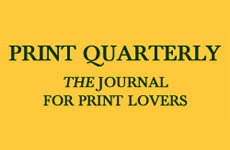 He did not experiment with color printing as he had in the ’30s, though he colored many of the later proofs with pencil. Theodore Roszak, The Last Tycoon (1973), lithograph in black, hand-colored with colored pencil, image 19 1/2 x 25 1/4 inches. Courtesy the Estate of Theodore Roszak/Licensed by VAGA, New York. Eggs also populate the lithograph The Last Tycoon (1973), a creepy science-fiction scene of a Gulliver-like man stranded on a raft in an isolated landscape with a strange structure growing out of his chest. 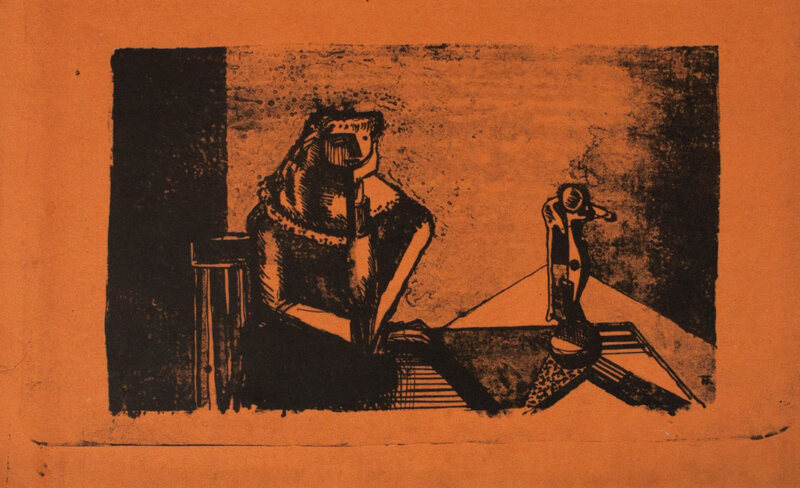 The image refers back to Roszak’s 1932 painting Mechanical Man depicting a robot controlled by an artificial heart and a lung machine fitted over its chest. 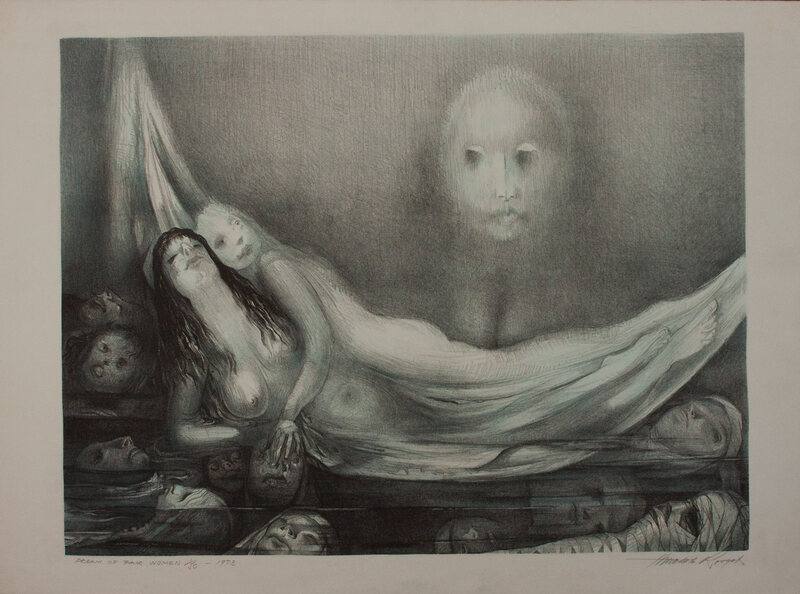 A similar figure also appears in the lithograph Tryst (1974), where the raft has been replaced by a mattress, the landscape by a room, and the chest-topping structure by an emaciated female figure (one might read this as tycoon turned lover). Theodore Roszak, The Brood (1973), lithograph in black, image 19 x 19 inches. Courtesy the Estate of Theodore Roszak/Licensed by VAGA, New York. without the least borrowing of the French master’s forms.”37 In The Brood (1973), the circular eye of the mother bird, with its pitch-black pupil, is reminiscent of Redon’s free-floating eyeballs. That eye also forms the center of each little bead that makes up the “worm” she feeds the gaping mouths with pointed beaks of her greedy, evil-looking children. 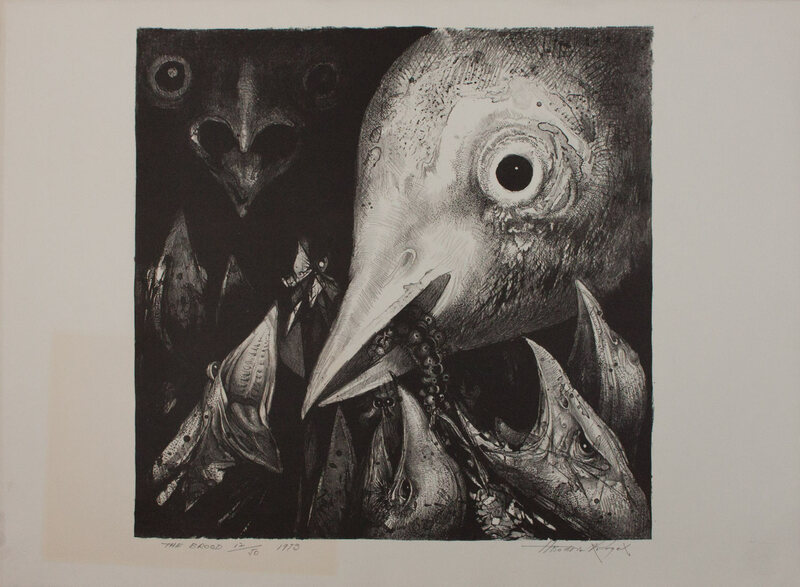 Here the potentially benign image of a mother bird feeding her young has been turned into a horrific allegory, a caricature of corrupt politicians fighting each other for a piece of the worm. The pale red, blue and green make the hand-colored version even more repugnant. Theodore Roszak, Dream of Fair Women (1973), lithograph in black, hand-colored with colored pencil, image 19 x 25 inches. Courtesy the Estate of Theodore Roszak/Licensed by VAGA, New York. Like birds, butterflies had special significance for the artist. In the print Papillon (1972), Roszak’s skilled draftsmanship transforms a branch and diaphanous butterfly into a human face as wings dissolve into veins and arteries. The spidery lines and dark webs of cross-hatching suggest attention to Rembrandt’s etchings, while the pale blue-green background applied by colored pencil on one proof heightens the strangeness. Other images are social satires in the tradition of Goya and Daumier. The arrogance of scientists was the target of The Physicist (1972). With bulging eyes and red lips (in the hand-colored version), the subject balances a sphere on his turned-up nose (a triangular shape Roszak liked to use) like a seal learning tricks. In addition to the Daumier-like caricature, this image looks back to Roszak’s own early portraits such as those of the botanist, the artist and the prisoner. Theodore Roszak, Floodtide at Watergate (1974), lithograph in black, hand-colored with colored pencil, image 21 1/2 x 29 inches. Courtesy the Estate of Theodore Roszak/Licensed by VAGA, New York. Political corruption was tackled overtly in Floodtide at Watergate (1974), which shows a massive crowd of protesters, members of the press and a woman lounging in the water. 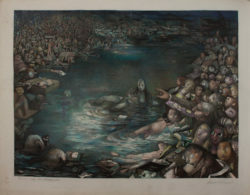 Sara Jane Roszak acknowledges the apocalyptic implications of the image, but adds also that her father loved to draw crowds and put them in water.38 Other prints refer to the Chappaquiddick scandal in which a young woman died when a car driven by Ted Kennedy went off a bridge. Recollection at Chappaquiddick (1973), Council at Chappaquiddick (1972) and Rendezvous (1972) are filled with hordes of small figures and topical allusions—a mirage showing a girl’s head lying beneath the surface of the water, a realistic image of the United States Capitol, schools of fish, a car and a bridge. Dump Heap U.S.A. (1974) comments on the detritus of civilization: a mound of garbage filled with people and things, surmounted by backhoes. The minute details are enhanced in one proof by colored pencil applied in a pattern of little mosaic-like dots, bringing us full circle back to the ornamental features that filled his early prints such as Woman (artist’s grandmother) in Veiled Hat with Cactus Plant. 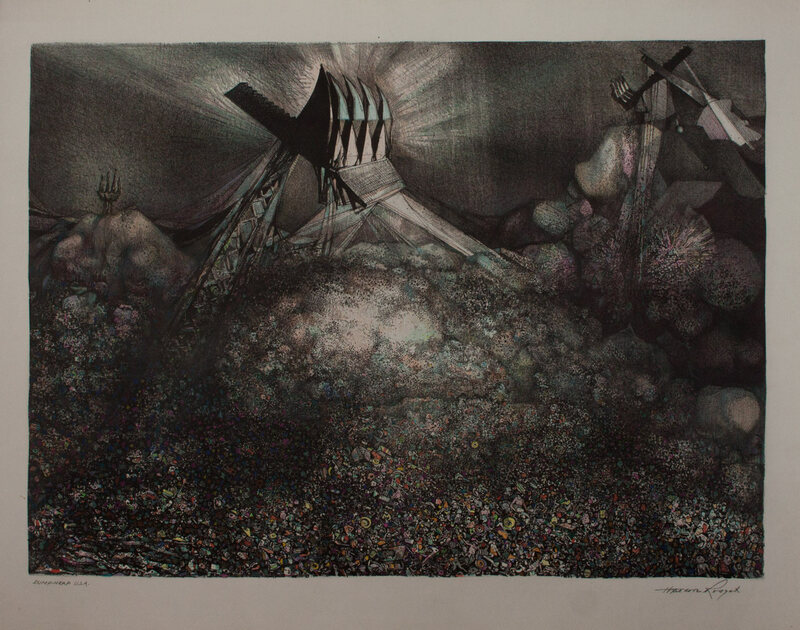 Theodore Roszak, Dump Heap U.S.A. (1974), lithograph in black, hand-colored with colored pencil, 21 x 29 inches. Courtesy the Estate of Theodore Roszak/Licensed by VAGA, New York.